Karla Zazueta has written an important and needed essay. 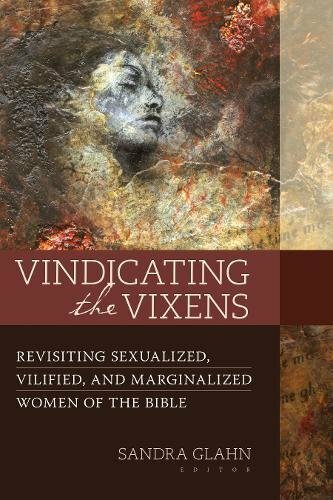 In her contribution to Vindicating the Vixens: Revisiting the Sexualized, Vilified, and Marginalized Women of the Bible, she attempts to peel back the layers of myth and misinformation that have grown around the figure of Mary Magdalene over the years. Despite being one of the most famous women in the Bible, Mary is also one of the most misunderstood, having been cast in different times and places either as an ex-prostitute or as Jesus's secret wife/lover, erased from history by misogynistic church leaders. Through her close engagement with the Biblical text and her attention to historical context, Zazueta presents us with a portrait of a different woman altogether, the real woman, one who dedicated her life to serving Jesus. After being healed of the seven demons who possessed her, Mary became a permanent member of Jesus's ministry, following Him wherever He went (Luke 8:1-2). Along with several other women, she used her own money to support Jesus and the disciples (Luke 8:3). Defying the cultural norms of the time, she studied Jesus's teaching alongside His male followers. When all but one of the Apostles abandoned Him, Mary followed Jesus to the cross (Mark 15:40) and to the tomb (Mark 15:47). Three days later, she also became the first person to behold the resurrected Christ (Mark 16:9-11). Though she may not have been one of the Twelve that everyone knows, Mary was still a crucial part of Jesus's earthly ministry. To me, this chapter was a breath of fresh air, not just because it dispels the myth of Mary Magdalene, but also for what her story reveals about Jesus's attitude toward women and His vocations for them. As a young Christian woman, the messages I receive about vocation can be pretty discouraging. The world tells me to find my fulfillment in a career as if meaningful existence is only possible through the accumulation of money and power. Rejecting this materialistic view of vocation, I turn to leaders in the Christian community but find many of their messages lacking as well. On social media, on blogs, and in Christian books and publications, I see it preached that men and women belong to separate “spheres” of society and that a Christian woman is not really doing her duty before God unless she stays in her sphere. And what is included in that sphere? Homemaking, hospitality, raising children, and submitting to a husband. That's about it. To be sure, these are all wonderful things, things that the world needs and that a woman should pour her heart and soul into—if and when God calls her to them. I start to disagree when writers and pastors teach that these are the only legitimate ways for a woman to live out her vocation. Call me a liberal, but I don't think it's right to teach young women that they have no vocation of their own apart from helping a man fulfill his vocation. I don't think pastors should be telling women to find their total fulfillment in the home. Because the thing is, women can't and shouldn't find their total fulfillment in the home, just as they can't and shouldn't find their total fulfillment in a career. Fulfillment comes from Christ alone, and from serving Him as He has called you to do. And, looking at the example of Mary Magdalene, I don't think His calling for women is quite as exclusive as some Christians may think. Like any woman—like any person—Mary Magdalene's identity was expressed in a number of ways. She was a scholar, learning the Word of God from God's own Son (Zazueta likes to call her “the first female seminarian”). She was a benefactress, freely giving her money to support Jesus and the members of His ministry so that they wouldn't have to work. She was a witness, bringing the good news of Jesus's resurrection to the disciples. Above all, she was a servant of God, following Him and doing as He commanded her. This is what God calls us all to do, whether the service He requires of us takes place primarily in the home, in the outside world, or in both. As Ruth Hoffmann pointed out in her post on Deborah, God's call can take many different forms … and sometimes it takes the form which man least expects. Womanhood is not a performance that depends on one's occupation or situation in life. It's not even the defining feature of a person's identity. As Christians, our identities are defined in relation to God: we are His craftsmanship, His servants, and His children. We are fearfully and wonderfully made. And as such, we cannot possibly be made to suit a script written for us by man.